The best pillows I've ever had. Filled with rich and hypoallergenic down-alternative, both of these luxurious pillows from National Sleep Products offer comfort that is suitable for any sleeper, even those with sensitive skin. And, because they are offered in three firmness options, you can choose which set is best for you. The pillows are perfectly sized for standard and queen-sized pillow cases. These pillows are packaged tightly during shipping. Upon receipt, remove this item from its packaging, fluff gently, and allow several hours for full loft recovery. In addition, products sealed in plastic packaging sometimes have a disagreeable scent because of concentrated fibers. A few hours of airing typically removes the odor. I am loving these pillows. I've slept with them twice and I'm already sold. I purchased the firm option as a back & side sleeper. When I recently moved, I purchased a bedding set that included king size pillows, a comforter, duvet, and sheets. However, the pillows came in the softest down version as standard. They were way too low for me. I would stack two pillows on top of each other to get the loft and head cradling I preferred. Now, with these firm pillows, I only sleep need one and it feels amazing. Quality at an amazing price. No need to spend *** per pillow as certain bedding companies might make you think! Also, I had queen sized pillowcases (20x30) but these generously plump pillows filled them in quite nicely even though they're 20x28. As you can see in one of my photos, the pillow has about an 8-inch loft. As a side note, when I sleep on my side, my head doesn't sink so far into the pillow that it fluffs up to obstruct my mouth and nose...in case anyone is wondering. Overall extremely comfortable pillows...turns my bed into a comfy cuddle trap! These pillows are like sleeping on clouds! My husband I love them! There a great buy. I got the firm fill since it recommended that for "side" sleepers they're still soft comfortable. I would recommend them to anyone! I shall attempt to remove the subjectivity of this review, and explain any opinion, or support it to help you make a decision. Too many reviews aren't so, and just buying the item in question is not always a good way to find out whether the gross divide between opinions was valid or not. That said of course anything made in batches can differ in quality from a previous or proceeding batch, but with quality control standards, the differences should be negligible. Sometimes when reading reviews, it's fairer to throw out the worst and very best. My experience has been entirely positive, I hope this helps. The pillows I ordered were the medium firm option. They arrived in a box, enclosed in pairs in a large clear plastic bag. They were plump to begin with and after three nights, remain plump. The fill quantity seems sufficient where they do not appear to need plumping to restore their original shape in the morning, or indeed during the night. Now for a little more subjectivity, I like a pillow that sinks under the weight of the head, but doesn't flatten to a pancake. Too much plump puts strain on the neck, just as too little may, or may simply be uncomfortable. I am used to down and feather pillows which replicate what I have just described. I switched to this product because sharp feathers and down leakage were becoming tedious, perhaps it was just an issue with those pillows I used to have. These pillows are the best thing since sliced bread! I never imagined I could find a pillow I love so much that I never want to lift my head off of it! I am tempted to order more to have for the future if heaven forbid my new ones wear out!!!!!!! Great pillows. The size is in between a standard pillow and a queen pillow. Very comfortable and they fluff up well after use. i don't even have the words to describe how WONDERFUL these pillows are! i ordered two sets on a sale day - one firm, one medium. i've found the firm to work best with sham pillow covers, and medium for sleeping pillows. this is coming from someone who has terrible shoulder and neck tension and pain. for the first time in ten years, i wake up with no stiffness, no pain whatsoever, and no headaches! at the end of the day, when my neck and shoulder pain gets to me, i often get headaches. now, i go straight to bed to lie down after work, and these pillows instantly alleviate a lot of the pain! they're down-like, indeed, but they spring back up a little when you sink your head into it so it offers the perfect amount of support. the pillows are great quality - i did noticed the "crunching" sound people have been talking about upon opening the packages, but haven't noticed it at all when in pillow cases. the alternative down leaks out a tiny tiny bit (negligible) when pillow is fluffed, but overall these are a great value. second purchase from overstock.com - so far we're 2 for 2! love, love, LOVE these. better than store bought at this price. They are so comfy and will be buying more shortly as my husband and I fight over who gets them. They are standard pillows but have to use queen size pillow cases as they are so fluffy which is ok because we have a queen bed. I have always had a difficult time trying to find a comfortable pillow that wouldn't go flat a few minutes of lying on it. This pillow does not go flat. I purchased the firm pillow, it's provides support but still soft and fluffy. My husband thought that a pillow was a pillow, but he found out that this pillow was different...it is comfortable. The price is unbelievable for a package of 2. The only thing that disappointed me was the size. I have a king size bed and would like to of had the choice in Queen or King size, but that was the only thing that I didn't care about. Enjoy and happy sleeping. I love these pillows. I ordered the soft, and they are perfect. They have the moldable, soft quality of down. In fact, I like these better than my goose down pillow. I previously proclaimed the Angel Soft down alternative my all time favorite, but I have to amend that now that I've tried the Premier Down-like pillows. They have more support and substance than the Angel Soft, which quickly flattened to pancakes. I also ordered the medium Premier Down-like pillows -- at this price, why not? -- and found them to be good for reading and supplementing the soft ones. Also for the look of the bed. They are a little too firm for me as a primary pillow. But the overall quality and value of these pillows is superb. And the combo of soft and medium is just perfect. Very pleased with this purchase. 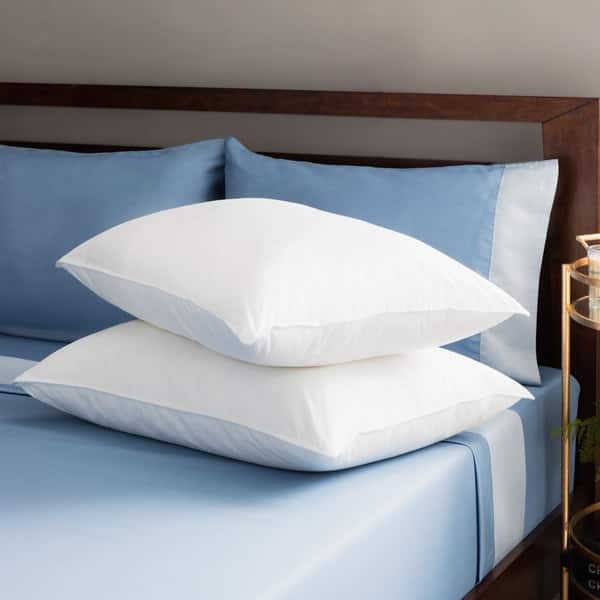 Although the pillow is comfortable and has absolutely no scent, it is very bouncy in the way it seems air is trapped inside and if you hit one side of the pillow you will make the other side of the pillow bounce up. It doesn't feel like my old down pillows at all. With my foam bed, I find that my shoulders sink into the mattress too much to get comfortable with this pillow. It's simply too fat and causes my neck to get bent upwards. I picked the medium density option, and I'm a side sleeper. I think if I had a much firmer mattress then it could be ok, but I have broad shoulders and this could be even more of a problem for people without broad shoulders. My head sinks in at approximately 4.5 inches from the mattress to my ear. I do really like, however, that my arm does not feel much pressure while being underneath the pillow compared to my old down pillows. This adds another half inch or so to the height of the pillow though. :( If I had the option, I'd return these for the soft fill instead. I bought a pair 3 years ago. Every pillow I've tried previously breaks down and becomes a hard lump. Not so with these pillows. You can still give them a shake and they fluff up perfectly. I am recovering from a fractured shoulder therefore have found difficulty in finding a comfortable position when in bed.I decided to do some research and found your site and after having read the reviews decided that perhaps I would find exactly what I was looking for! My 2 pillows which have aided me no end in finding the correct position without too much discomfort caused from the fracture are just what I needed! The pillows mould into the shoulders and head giving me a comfortable support using either one or both pillows. Thanks to yourselves I am now managing to sleep more comfortably and would definitely recommend the pillows. These pillows are replacing my 10 year old polyester pillows (which are flat but otherwise clean and perfectly good) and wow! what a change :D. They feel like down exactly except without anything ever poking you or the crunchiness of new feather/down pillows. I really really like them and they were fluffy right out of the package with no smell. LOVE THEM and HIGHLY RECOMMEND! Very lofty and comfortable pillows! I have asthma so they are the perfect choice and were a very good value! I would definitely recommend them to anyone looking for new pillows. These pillows are so comfortable the first night we had them my husband overslept and woke up an hour late for work. He has never overslept in the twelve years I've know him, so that's pretty impressive. We purchased the medium firmness and they are just right. I would often wake up several times each night removing or adjusting my pillow to alleviate neck and shoulder pain. Since we got these pillows I have finally been able to enjoy a full nights sleep. They machine wash and dry just fine. The price was excellent for the value you receive. I like the fact that they are not down, due to my allergies. I am going to buy a set for every bed in our house. The pillow fabric is stiff and it is noisy. The softness is good but I can't get over the rustling noise. Will keep because they will work fine for extra pillows or shams. I would not reccommend for any other customer. I'm one that always likes to feel, squeeze and inspect pillows before bringing them home. In the past, when I've ordered pillows described as down, I've not liked them because they're too soft and go flat once you put your head down on them. These pillows were a delight from the first night. I don't get a headache from them going flat, but they pleasantly go into any position you'd like without popping back out. They're soft and so comfortable, you need to try them.I got the medium. Used for our second home which also is a rental part of the year. They have been very comfortable and worn well. Good pillows. I had these for years. I use 4 pillows on my bed. 2 that are thicker for the decorative shams and 2 that are plush to sleep on. These to sink but I like that. Flattened out first night. Returned this set. Good pillows for the price. They are comfortable and they hold up after I wash them. I would absolutely recommend them. I don’t think anyone would be disappointed. I eould but them again. I've slept on a pair of these pillows nightly for a little over a year now. They have held up well through multiple washes. The seams are in tact and the material inside has been durable enough that I can still fluff the pillows every week, making my bed a really inviting place. "Do these pillows flatten fast/easily? Looking for some good support for back/side sleeper. Thanks!" This is a down alternative pillow, designed for soft to medium support. Side sleepers are better supported with a firm or extra-firm pillow. "Hi, I bought the medium pillow and it has too much loft for me. Will the firm be condensed and have less loft or will it have more loft since it has more fill weight? Thanks"
I don't know...only used for fillers for decorative shams....sorry! "Do these pillows stay cool at night? I am always warm at night and am always turning my pillow but then it gets warm again and I turn it again. Would love a good nights sleep. Thank you"
It's really not a cooling pillow, it does end up warming up with your body temperature. Very comfortable, though. 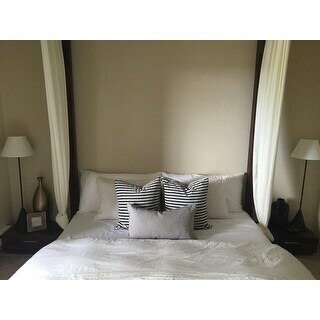 I PUT THE PILLOWS IN MY SPARE BEDROOM SO I DON'T KNOW. "When will the medium pillows be back in stock? Will you be carrying them again?" "Does the crackly sound of the pillow lining go away over time/through washes? Though not rough, the cotton makes a lot of sound. I find it very loud when I move my head around while on it. Still deciding whether this will trump the comfort of the pillow density to warrant a return. The medium firmness is great for me as a back sleeper." "I'm somewhat confused as to the choice of density for a Primaloft pillow (alternate down). The kind I like the best is when you fluff it up and when you lay your head on the pillow, you sink down and are surrounded in comfort. I'm definitely only a side sleeper. Should I order Soft, Medium or Firm density. Thank you." I ordered these in medium for a guest room and all the guests that have slept there loves them. I can't personally say but seems like the guests love them. I am a side sleeper and I use the medium density. I also like to fluff my pillow and the medium works well for a side sleeper--supports the neck while allowing the head to sink in a bit, thus keeping the body in good alignment. "Are there pillows specifically made for a California King bed?" No, these pillows are for a Full or Queen not a King or California King. This product is not yet released, and is expected to ship on Feb. 20, 2006.